SJ Joinery an Building Ltd has been established for over 20 years drawing on 34 years’ experience in the construction industry, during this period we have undertaken many varied projects throughout Staffordshire, Derbyshire the East and West Midlands including Barn conversions, Alterations works, Commercial works, Renovations, New Builds, Joinery Fit Outs. We have an extensive list of clients including Blue Chip Company’s and Private clients, we are able to undertake and fully manage projects form a value of a few hundred pounds up to to several million pounds, we pride ourselves on delivering projects to the highest standard of craftsmanship, on time and within budget, we have received the Staffordshire Building Excellence Award twice for past projects, Agardsley Park Farm – Four Barn Conversions and Hanbury Grange Farm – Four Barn Conversions. We are able to work with and advice clients in realizing their projects, drawing on our considerable knowledge and experience, we have reliable professional staff and employees plus proven Subcontractors that we have worked with over several years/decades. 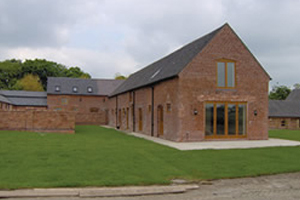 Building on our success we established Blackbrook Developments in 2008, to undertake speculative house building and investment in residential and commercial property, Blackbrook has an ever expanding portfolio of property and completed projects. We would welcome and investigate any potential development opportunities. We would be happy to discuss and advise informally or provide a formal tender for any project.